Genius Loci Games: Quick Note - Wow how this has Changed! Quick Note - Wow how this has Changed! Was looking over my vast collection of 3.5 edition modules tonight (to be exact the Pathfinder modules) and was amazed to see the pre-gen sheets in the back. 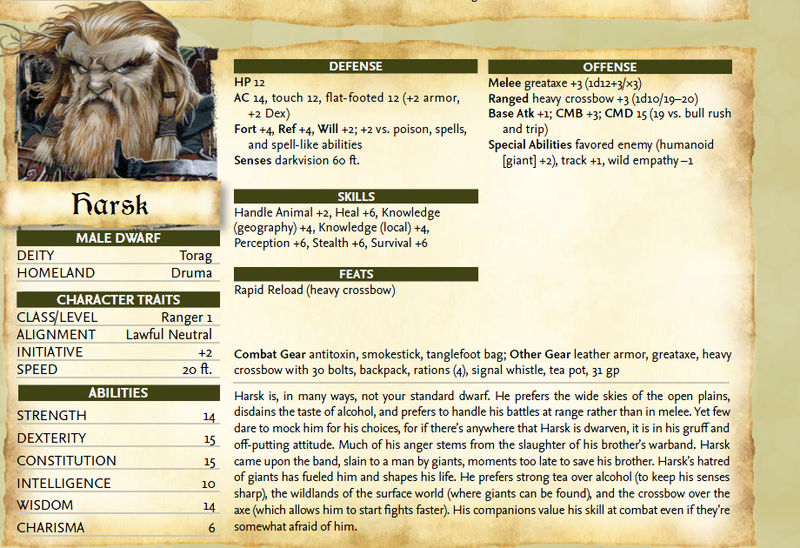 Now comapre that to the Harsk pre-gen that appears in the Kingmaker Adventure Path. What the heck? Was the nice, streamlined and quarter-sheet character sheet not enough? It was wonderful in its simplicity! Really I don't understand this move to bigger more word filled sheets that cover the same (or less!) information than the quarter page sheet. It truly boggles the mind that they would regress to a bigger size instead of keeping with the smaller streamlined version. Oh that reminds me, I wrote a Pathfinder adventure. Genius Loci on Save or Die. Quick Note - Another peek?